I’m very pleased with how the phoenixes came out, at least in the yellow-on-orange portion. I don’t like the color gradient otherwise, though, as I think it’s too boring in the areas where the phoenixes blend into the background. (well, DUH!) So, for my next sample, I’m going to try a black tabby warp with a red-to-yellow color gradient in the pattern warp. If I start with a dark red for the phoenixes, it will blend in at a distance while remaining visually distinct close up. This has been a real challenge to weave since the tabby warp is 140/2 silk. I broke a thread about every two or three inches (sometimes more often) – though there was one glorious six-inch stretch where nothing broke! I’m hoping that this will improve as I get more accustomed to weaving with fine threads. 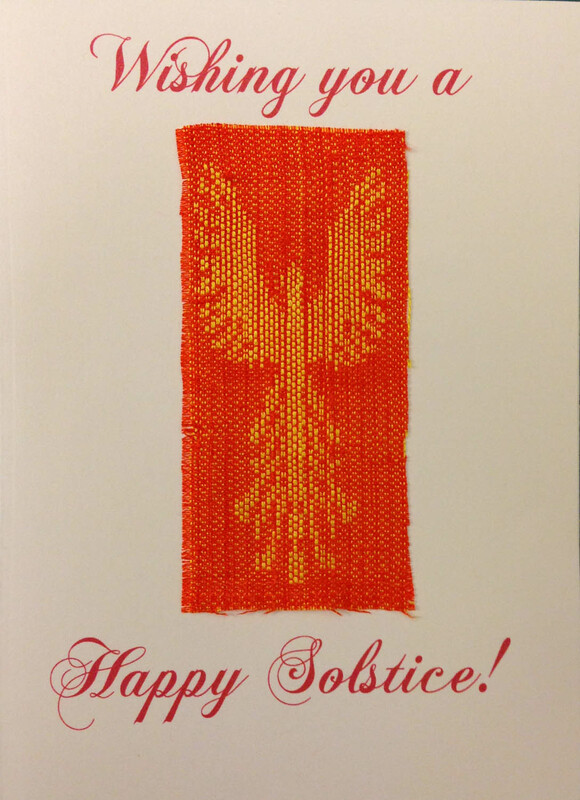 Happy Solstice to you too! Great card! Thank you!